Have you ever wondered what are all those patches for on your uniform and just exactly where do they all go? patches mean and where to place them properly on your uniform. 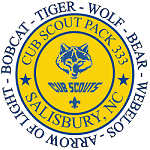 The following patches are worn on the uniforms of Leaders and Cub Scouts from Tigers through Webelos Scouts. but additional ones can be purchased at the Scout Store. also attached to uniforms when purchased. emblem as part of the uniform. Emblem instead. There are numerous emblems available. This award is given units who have met a list of requirements. This award is worn on the right sleeve of the official uniform. uniform are the same. Our Council is the Central N.C. Council. patches that are sewn on next to one another. which has silver embroidery and border. The first badge a Cub Scout earns before any other badge. It is worn on the left pocket. den activities, and five Go See It outings. It is worn on the right pocket. eight years old and have completed the 12 Wolf achievements. leader can present the Progress Toward Ranks patch to him. It is worn on the right shirt pocket. and centered under the current rank badge (Wolf and Bear). transition towards a Boy Scout troop. It is worn centered on the left pocket. of the Webelos cap or on the Webelos Colors. you earn. Pin these compass points on the emblem in the "E,"
"W," or "S" positions, in any order you choose. badge that can be worn on the Boy Scout Uniform. It is worn centered below left pocket. middle between the top of the pocket and the shoulder seam. also include a medallion or other memento. emblem program as a youth member. For more information on the Square Knot Insignia, Click Here. while you are a Cub Scout. years as long as the requirements are completed each year. earned, a wolf track pin may be added to the flap. may wear the pin on the Outdoor Activity Award patch. below and touching the right pocket.